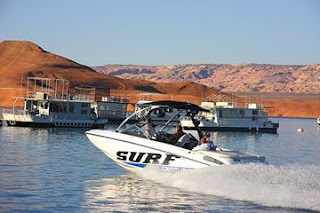 Lake Powell Watersports Vacation in May, Wakeboard,Waterski, Wake Surf Lake Powell Apirl 7th - Apirl 14th at Wahweap Marina, Page Arizona. Watersports, Wakeboarding, Waterskiing, Wake Surfing reserve your spot today. Come join on us on Lake Powelll for a week of watersports, we bring the professioanl wakeboarding ski boat equipped with surf package for the ultimate surf wave. We will have all the equipment needed for the ultimate watersports vacation. TK Watersports will have the boat already there saving on cost. This is a great value even for boat owners you can get an early trip with out the hastles of towing your boat. Apirl water temperatures at Lake Powell will be chilly but not to bad 55 - 65 degrees Surface waters temps.